Last week's visit to Paris coincided with Bastille Day, France's most important national holiday. 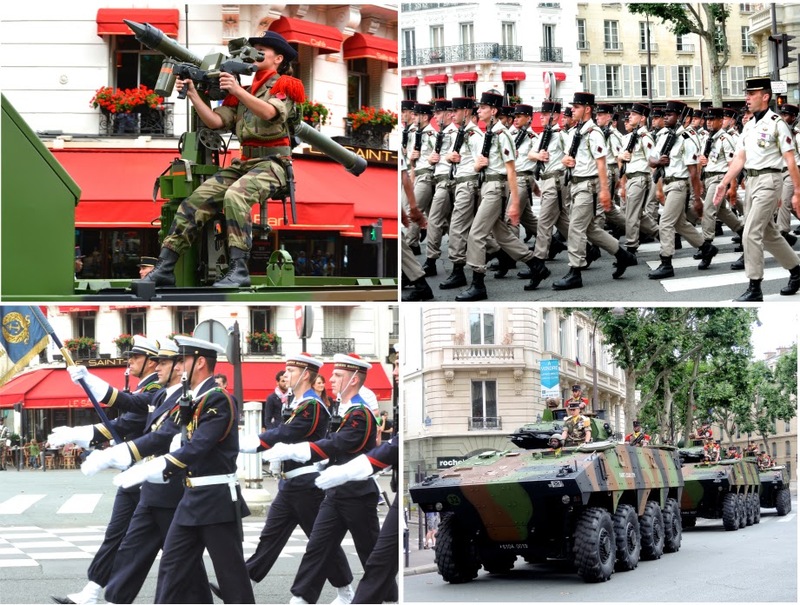 'Le 14 juillet' is celebrated throughout the country with dinners, dances and fireworks in the evenings, and in Paris, a magnificent military parade on the Champs-Élysées takes place in the morning. Visiting Paris on Bastille Day is a special and memorable event, even if you don't join the crowds along the Champs-Élysées and around the Eiffel tower. The atmosphere is magical, particularly until lunchtime, where in large parts of town the traffic is completely stopped. A usually bustling city wrapped in silence feels almost unworldly, and is further heightened in places where a lot of people are gathered.. even large crowds can't replicate the sound level that traffic produces. The events on the Champs-Élysées finished around noon, and afterwards the streets were filled with cadets, soldiers, legionnaires and officers who met up with their families, friends or girlfriends. Thank you for sharing the excitement of Paris on Le 14 juillet! I have always wondered what it might be like! Thank you Lauren, happy you enjoyed the post! Well, that's quite the show, lovely to see it celebrated in situ, I went to the Edinburgh version last Monday and envied all of the chic French bobs. Great day to visit this iconic day...love your outfit choice too, tres chic! How stylish are those Legionnaires in their uniforms! It was truly special and fabulous, so glad you enjoyed the post! I was there last week too and it was a special moment for everyone! Oh so nice to know! Hope you had a fabulous time! Oh, don't the men look handsome in their uniforms -- vive la France! I love that you chose the Bastille Day colors to make your capsule wardrobe. Thank you for sharing the little video clip - it's such a stirring song I had to go out and find the whole thing on YouTube! Agree with you on the uniforms, dear Fifi! I tried to find the song on YouTube, without success... if you happen to have a link, it would be lovely if you could post it here! What a wonderful vacation you enjoyed! And the surprise of the troops marching by--a fantastic experience--your video was almost like being there. And do my eyes deceive me, or is that a woman 'manning' the rocket launcher? I love it! I especially loved your outfit, but wish we could have seen a photo of it! Or are you hiding somewhere among those handsome men in uniform?! I'm so glad I rememberd the video button on my camera just in time! Your eyes were seeing right...quite a few women took part in the parade. No pictures of me this time though, I was so busy taking shots of the day's events that I completely forgot! Merci MAITAI pour se si joli post . Merci chère Myriam, woaw votre beaufils a participé...quelle honneur! J'imagine la préparation pour le défilé prend beaucoup de temps, c'est toujours parfait! It's always such a great event! How lucky you are to see it in such close proximity. Do you think the Legionnaires still wear Palladium boots?